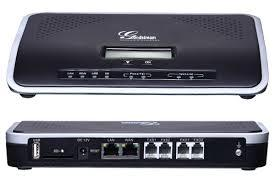 If you need to set up a small telephone system that brings enterprise-grade features to small-and-medium sized business without the need for any licensing fees, costs per feature, or any recurring costs, setup a Grandstream UCM6100 series IP PBX which is a full-featured, easy-to-manage IP PBX appliance. As it is powered by advanced hardware platform with robust system resources, it offers a highly versatile, turnkey solution for converged voice, video, data, and mobility applications, including fax and video surveillance to boost your business. Apart from that it also offers quick and easy setup and deployment using a web-browser – that features auto-discovery of IP endpoints and zero-configuration provisioning and from the security and reliability point of view, it delivers enterprise-grade features to small-medium business with unrivaled reliability - all at an unprecedented price point. It also consists of a flexible dial plan, call routing, site peering and call recording facility and it is also equipped with automated detection and provisioning of IP phones, video phones, ATA and other endpoints for easy deployment. The UCM6100 series IP PBX supports around 60 concurrent calls and around 32 conferences which helps you grow your business. It has an application processor with large memory and dedicated high performance multi-core DSP array for advanced voice processing which makes my work easier and smoother. From a security point of view it has hardware encryption accelerator to ensure the strongest security protection using SRTP, TLS, and HTTPS.